No matter how much I write about this beloved destination that I adore, there’ll never be enough to express the awe inspiring, breath taking, beautiful wonders that the Himalayan Mountain Range brings to all! While trekking within the Himalayas during the summer is quite a popular thing to do, there are many other ways to enjoy the magical spirit of the mountains – especially if you aren’t an ardent mountaineer, a huge trekking enthusiast or an avid lover of walking across the mountains. For starters you could try experiencing the beautiful serene towns that lie at the foothills of the Himalayan Mountains, and these five are my recommended. The city of Joshimath serves as a good base to explore the mountains and smaller towns across the North Western Himalayas in the Garwhal and Kumaon reigons. If you drive 250km southwest, you will get to the holy town of Rishikesh and Haridwar, a glimpse of the beautiful escapades in the Uttarakhand Himalayas. From this place you can drive up to Govind Ghat, which is the base for the trek to the Valley of Flowers National Park. 20km away is also the beautiful skiing resort in Auli. Auli is known to be a skiing paradise in the Kumaon Himalayas. If not for skiing in the winters, this place makes for spectacular views and a ride on the cable car ropeway is quite fun even during summers. With a sneak peek towards many beautiful regions within North Western Himalayas, this is the perfect spot to snuggle up and relax if you want a peaceful retreat away from the madness of cities. Leh was the capital of the Himalayan kingdom of Ladakh. It now forms part of the Leh district in the Indian State of Jammu and Kashmir. Though this is a huge stretch and has beauty varied with geographical diversities, it is more popular for its roadtrips on high altitudes, and the view of the expansive and different landscapes it has to offer. More importantly, the lakes and waters of this place make for magnificent viewings. On one side, there’s Tso Moriri and on the other side by the India-China border is Pangong Tso Lake. If it were up to me, I’d just go and settle down in this beautiful haven. With beautiful monasteries, the highest motorable road and the cold deserts of the Nubra Valley, Leh has a lot to offer and makes for a great stay especially during the months of July to October. What’s more, there are direct flights to Leh from Delhi, making the commute a lot easier. Situated in the Western Himalayas, Kaza is the gateway to the forbidden valley of the Great Western Himalayan Kingdom, known as the Spiti Valley. While getting there is an arduous task without any direct flights and the roads being one of the most dangerous in the world, once you’re there, the experience makes up for all the bumps and backaches you’ll incur on your journey there. Check out the views across Rohtang Pass and the short hike to Chandertaal Lake, and yes, once you’re there, the opportunity to visit one of the coldest villages in the world, Kibber, at 14,200 feet is the most blissful experience you’ll ever discover. One of the most spectacular views is of a gorgeous tall statue of Buddha sitting in the middle of nowhere, looking out onto the majestic mountains. The feeling you get out there is nothing short of magical. Known as the Queen of Hill Stations, Darjeeling is one of the prettiest towns in the North East Himalayas. As soon as you near the town, you’ll start to see views of the Kanchenjunga Peak. But there’s more to this place than just that view which almost sits in the background no matter which part of town you’re in. Darjeeling has some amazing restaurants, beautiful vantage points and a splendid ambience with its rustic Victorian legacy having served as a British hill station in the past. Wake up early at 4am for a visit to Tiger Point for a stupendous view of the sunrise. On your way back down, you can visit theGhoom Monastery, Japanese Pagoda which has some really amazing statues of Buddha in different poses. Darjeeling is also famous for its teas, so stop by for a cup of Darjeeling tea as you view the sunset on the terrace of the century-old Keventer’s Café. If you want to experience cool weather all year round, complete with chilly breezes, magical misty roads and some serious time and space to think about the meaning of life, then you’d want want to head to Mcleod Ganj. Located in the suburb of Dharamshala, it is also home to the Dalai Lama’s Temple known as Tsuglagkhang Temple. The town is also nicknamed “Little Lhasa” due to the large population of Tibetans living there. For me, a visit to the temple during prayer times was an enchanting experience. Whether you believe in any form of God or not, the spiritual journey is something that you’ll cherish for quite a while. The town centre gets crowded due to the hoards of tourists that come from all over the world to catch a glimpse of His Holiness the Dalai Lama, but you can quietly slip away to a small part of town called Naddi. It’s quiet, beautiful and serene here. Either way, don’t miss Mcleod Ganj, especially if you’re in Manali or New Delhi. 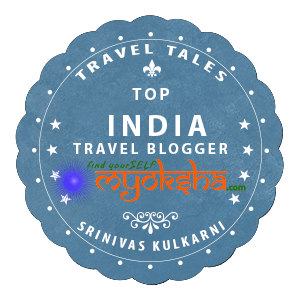 This entry was posted in North, Tales from Himalaya and tagged AsiaRooms, Auli, Himalayas, Joshimath, Ladakh, Spiti, Uttarakhand, Valley of Flowers on July 1, 2014 by srinistuff.